« Cider Summit Seattle Celebrates 6 Years! 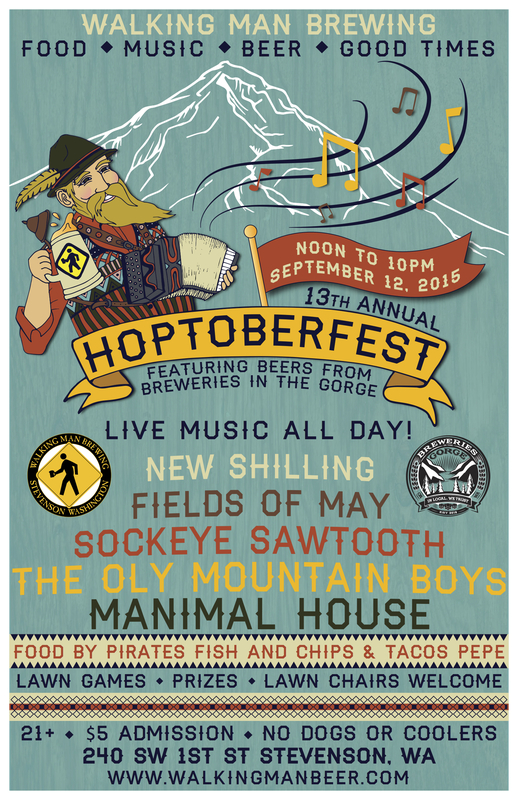 Stevenson, WA (August 11, 2015) – Walking Man Brewing will host their annual Hoptoberfest on Saturday, September 12th from noon to 10pm. This 21 and over event will take place in the field bordering the brewery in Stevenson, WA. In addition to live music, great food, lawn games and prizes throughout the day, this years festival will feature beers from the ten breweries that comprise Breweries in the Gorge (BIG). Walking Man Brewing’s Hoptoberfest provides the perfect setting to celebrate and enjoy the end of summer with friends and beer lovers from throughout the Northwest. The small town’s beautiful setting along the Columbia River offers a quaint, intimate feel that make this festival a highlight in the Stevenson, Washington community. “We’re really happy with the turnout last year and we’re excited to build on that success by including a fantastic lineup of beers by Breweries in the Gorge,” said James Landers, head brewer at Walking Man. Live music will kick off at noon with the Portland based Celtic group New Shilling followed by the Americana folk group, Fields of May. Sockeye Sawtooth of Portland and the Oly Mountain Boys from Olympia will get your feet stompin’ with high-energy bluegrass. Headlining this year’s festival, Portland’s funk band Manimalhouse will groove until 10pm. Lawn chairs are welcomed. No dogs or coolers allowed inside the festival. 21 and over event. Admission is $5 and includes re-entry throughout the day. Walking Man Brewing will be open for regular business from noon to 9pm. Dogs and minors are welcomed at the brewpub although not permitted to enter the festival. The brewery and brewpub is located at 240 SW 1st Street in Stevenson, Washington. For more information about Walking Man Brewing including brewpub hours, menus and happenings, please visit www.walkingmanbeer.com or contact Tabatha Wiggins at twiggins@walkingmanbeer.com / (509) 427-5520.